Please share any pictures of the camera's hardware, personal experiences or information you have learned regarding technical aspects of the camera and its operation. Thanks in advance to those who contribute. Last edited by Csaba Nagy on Sat Dec 12, 2015 12:21 am, edited 1 time in total. Some recent pictures from Dissembling the BMCC. First shown is the sensor assembly, showing the heat pipe / body cooling management. Next shows the Model number on the back of the Sensor. If there has ever been any doubt that the sensor is the CIS 2521F from Bae systems. This should eliminate any doubt. Last is shows the Dual stage peltier used in cooling the sensor. The specific type is unclear with no visible markings. It is a 30mm x30mm size. So as I bet we all have noticed internal Battery on the Cinema Cameras isn’t very good, especially over time. BMD states 90 mins, I can best around a little over an hour almost 3 years after. Which of course is not bad. The camera was designed to be powered off external batteries after all. However it made me wonder If I could change or swap out the internal Battery for another pack of similar electrical characteristics. My findings were quite revealing. This is great because it essentially uses a very standard voltage commonly associated with a 2 Series Battery Pack. As you can see the power consumption steadily hovers at around ~15-16 watts. And what’s interesting is power usage actually slightly drops when recording as opposed to being idle. Not alot, but contrary to what one might believe. The other thing I later tested is what happens to power usage with regards to the display backlight. From 100%-0% you see a drop of about 100ma. It’s not significant. So it will save you battery but not much. The most intriguing part of this test was the fact the camera drops out at around 7.30v. Anything below that and the camera will just shut off when you try to record. So when the Cam battery is “dead” it in fact still has capacity and from my calculations this remaining capacity can be as high as 40%-50% of the batteries total capacity. This is mind boggling to me and very much a Blackmagic design flaw. 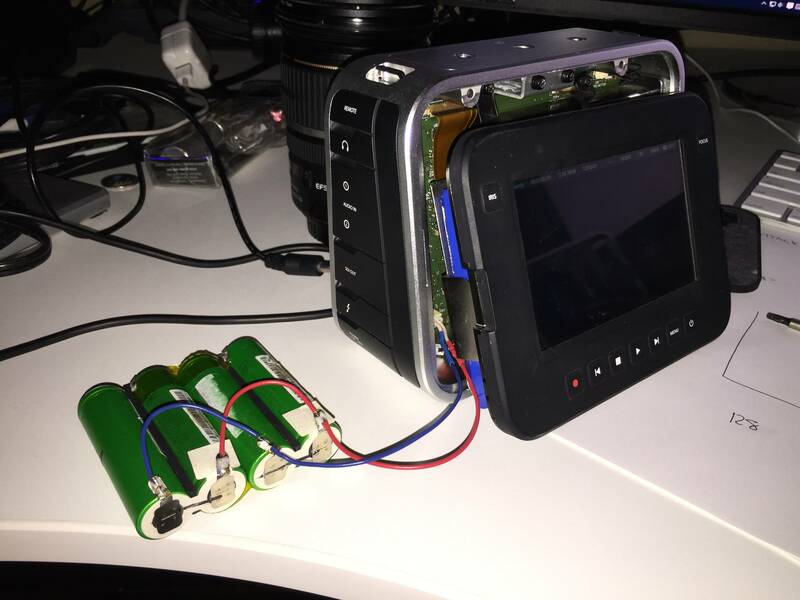 So if we do the math here’s the theoretical run times of the camera with the internal and my proposed battery. The real world performance is obviously less and degrades from several factors including time, temperature and environment. I put together a crude test battery pack that is 7.4v and 4800mah and it ran the camera for 2 1/2 hours. So there’s a look into how the Camera breathes. It’s less than perfect I’d say from these tests, but It works great as its designed for external batteries. However It can be modified and used more practically in some situations with any external power. More to come on that as await my shipment of new batteries. I see no balance circuit on your 18650 cells. Anatoly Mashanov wrote: I see no balance circuit on your 18650 cells. No but I have a protection board on order, so while testing I just monitored voltages carefully to make sure nothing would drop too low. But you almost don't need a protection circuit because as I stated the Camera powers down at around 7v which is still way above the safe over discharge voltage of most 18650. There is still a good amount of remaining capacity. So no worrying about over draining. 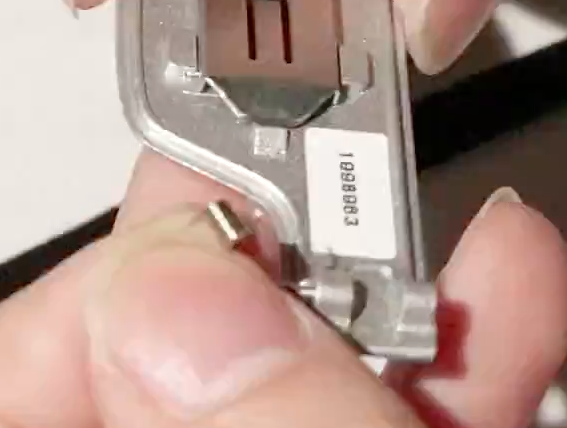 Csaba, did you have a look at the power input connector of the BMCC? It often fails to recognize when external power is plugged in, maybe there is a weakness in the construction? Could that be improved somehow? Just thought I'd share an interesting observation I saw recently. All BMD camera's are designed with a cooling system. The sensors contain a "refrigeration cooling system" which is done with a device called a peltier. Simply put when powering a peltier heat gets moved from one side to the other. Making one side cold and the other hot. In order to maintain the cooling effect the heat must then be transferred away from peltier's hot side by using some kind of heatsink. BMD's method of heat transfer for its early camera's use a flat cooling pipe from a company Amec Thermasol. This cooling pipe is made of MHP a material that by their testing significantly out performs copper. However for the first time I saw this image of a dissembled pocket with what appears to be a copper heat pipe. 1. Were copper heat pipes used in early manufacturing runs? 2. Were copper heat pipes used later to address thermal issues? 3. Which actually performs better? By how much? Just something that caught my eye and thought was interesting. Yes it's been awhile but my BMCC is finally running out of internal battery juice. Needs replacing. How went your higher power cell conversion experiment, in the end? Looking for a replacement for that Minimax LP904086 7.4v 3800mah 2s1p battery... Or better! Chris Ross Leong wrote: it's been awhile but my BMCC is finally running out of internal battery juice. Needs replacing. How went your higher power cell conversion experiment, in the end? It looks that the Li Ion batteries have a memory effect. Remove the batteries and slowly discharge them to 3.0 volts per cell. You may need to discharge them separately. Then charge them back to 4.2v. Do not discharge below 3.0v or charge above 4.2v. If their voltage differs then you again may need to charge them separately. Repeat 2-3 times. Every operation with Li ion batteries is dangerous, you have been warned. I've recently did this with Fitel S-121 battery which has been discharged to zero. 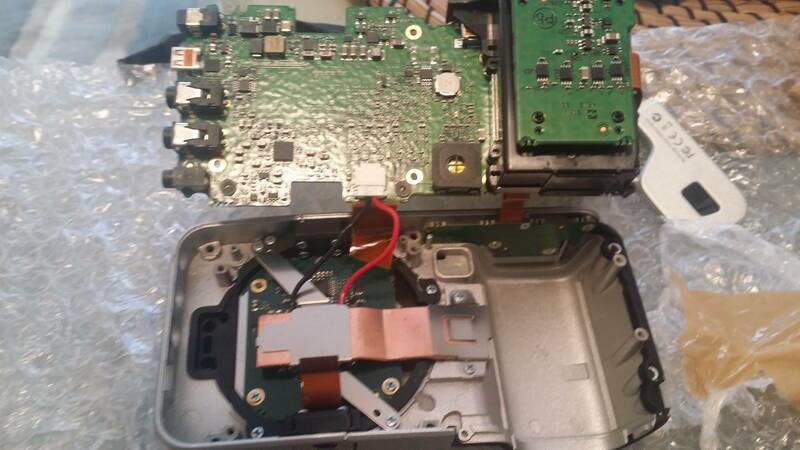 It was necessary to disassemble the battery pack and charge the cells bypassing the controller, then do 3-4 cycles. Now the battery keeps enough juice for at least 2-3 splices. The new battery costs more than I paid for all the splicer with battery and a set of eliminators. Have not used camera in a good 2 years...charged PRO battery the other night...was able to shoot for less than an hour. Don't believe I had the camera on all night long and wore internal battery out. Can't recall about the internal battery if even there is one. Any hints to what direction for me to research? Csaba, do you have serial number or year of each, that might be an indicator to which BM thought was better? I have a Peltier device that I removed from an old two way refrigerator. One issue with Peltier device is the significant power requirement, at least in the refrigeration example. It's either on or off, there's very little fine control available for these devices. The other thing about these devices is that the heat sink has to be significantly larger than the cooling side of the device. It's quite surprising how hot the 'hot' side gets with even the lowest voltage applied, so you have to have cooling from the get go, otherwise the entire unit starts to heat up. And in the refrigerator example, a fan is mandatory to get rid of the heat from the 'hot' radiator. I can imagine why the BMPCC4K has a fan based cooling system, as the composite body would have no way to act as a heat sink like the alloy bodied cameras. And with the higher performance and therefore higher heat, a Peltier device is going to struggle to keep things cool if installed in the traditional manner in a camera (as shown). They were very inefficient, and so generated significant heat of their own. 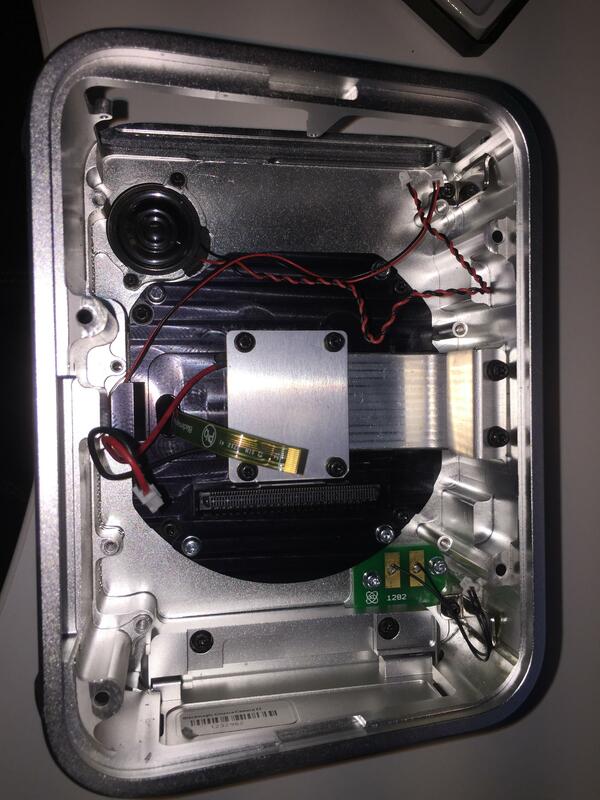 The pictures inside the case reveal less surface area to pick up heat. 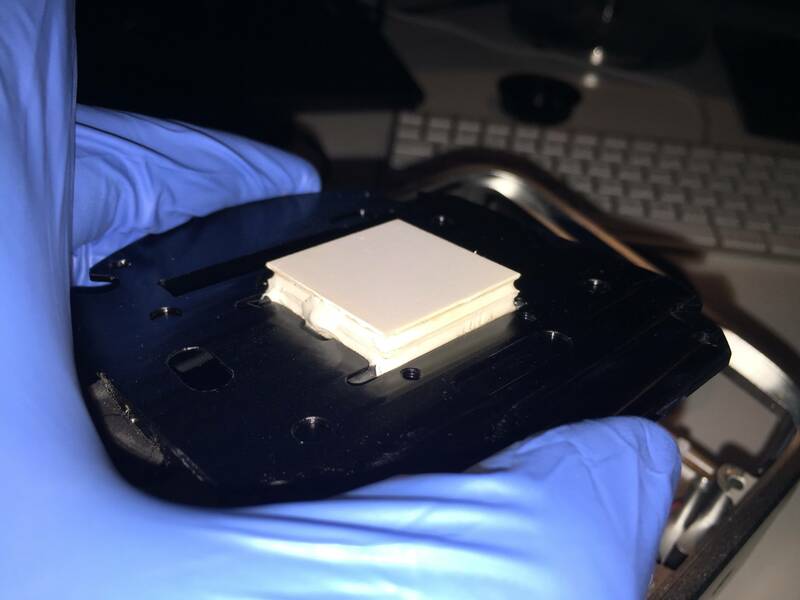 Microstructuring heat sink elements in the enclosure mold would probably significantly improve heating issues. But a fluid thermal unit feeding from top of the cooler to something stuck inside the case, might have helped. Preserving the existing cooler in order to pump heat to the second stage, but you could have the solid state unit between the fluid unit and the case instead. However, modeling/testing needed to find which is best. But, really more worth doing when the 8k+ pocket comes out. You know, that seems a poor way to conduct heat away from the sensor. 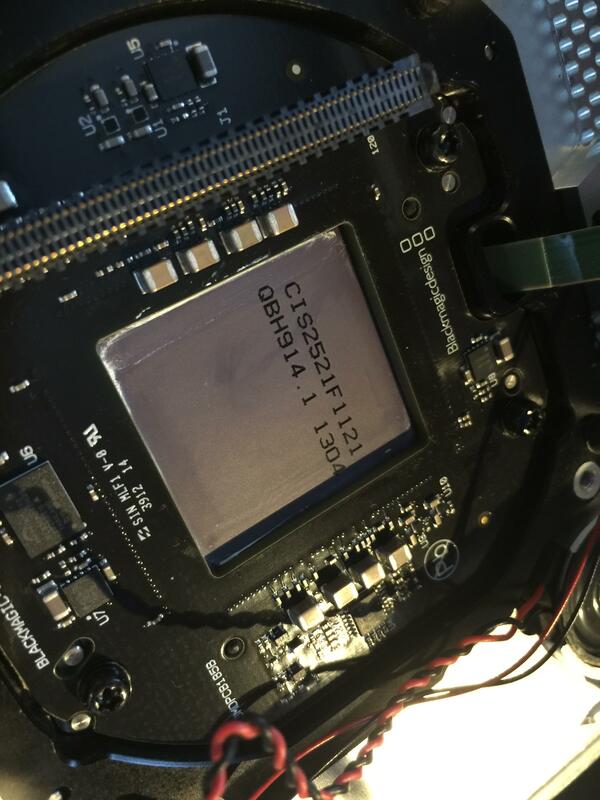 That area the thermal heatsink is attached to by thermal paste is in an enclosed area (maybe to stop the sun from getting to it too much under the skin. Is there some structure in the enclosure at that area, to conduct heat away from the heat sink? Also, what is the black skin made out of. If it is not thermally conductive enough, it could hinder cooling, and attract heat when the sun hits it. If all the answers are bad above, then testing it without the black skin, or substituting a white silica skin in parts which need to be handled, for grip, might be worth a look at. A miniature long heat sink and/or fan in the soit opposite where the heat fin attaches to the case might help. But let's step back, again. If the sensor is 0.8 watts max, and maybe a lot less at 30p, and the screen is 0.2 watts, where's the rest of the something like 29 watts reported going? That's the enemy here. Having that much producing heat floating around trapped in the enclosure. Would a micro heat sink structure attached to the outside of a bare case be enough, or b) stick to the inside as well, or c) with fan as well pushing internal air onto it, D) a fan in the outside of the heat exchanger as well?